German outfit Hämatom is preparing the release of their 4th studio album Keinzeitmensch, as an appetizer and a special treat for their fans they present Alte Liebe rostet nicht, a 4-track EP which is limited to 1,000 copies. The closer is a remix of the title track and sounds to me a bit EBM-ish, but I'm not very familiar with EBM, so don't shoot me, if you don't agree! 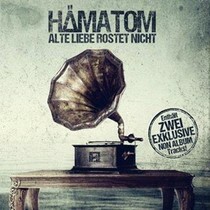 The EP is a real treat for Hämatom fans and a nice way to shorten time til the album Keinzeitmensch will be in stores!